Being sick is no fun. Especially having a child with a fever. 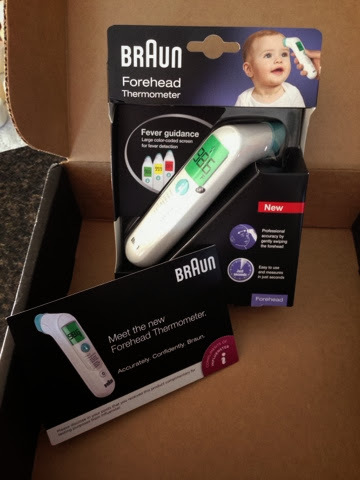 I was given the honor the other day by Influenster to check out and try the new Braun Forehead Thermometer. This thermometer tells you the temperature digitally and the screen shows green, yellow or red for different temperatures along with your temperature. If your temperature is high the background shows red. For a low grade fever the background is yellow. If there is no fever green is the background color. This thermometer is very fast and easy to use. You get accurate readings within seconds. I love that you can see the screen in the dark, so no more having to turn on a light to read the temperature and waking up your precious little one. I really like this thermometer, to me it is one of the best digital thermometer I have used. There is a $10 rebate for buying this product on the Braun website.